Nearly all potential car buyers go online to research a vehicle. And while responses to Internet leads have improved markedly in recent years, some dealers are still struggling with the quality of follow-ups. Greenway Dodge in Orlando, Fla., however, is not among them. 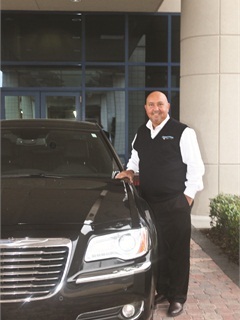 Since Ricky Lopez joined Greenway Dodge’s team as Internet manager, sales originating online jumped from 144 in 2009 to approximately 3,300 in 2012. Now, 71 percent of the dealer’s sales start as an online lead. Every shopper who connects with Greenway Dodge online typically receives a personalized response within nine minutes, thanks to Lopez’s “round robin” approach. When a lead comes in, a member of his 21-person Internet team — who set appointments, greet customers and shepherd them through the transaction process — must respond within that time or the lead is forwarded back to Lopez for reassignment. Staffers are removed temporarily from the rotation if they’re working with a customer on the show floor. According to a mystery-shopper study conducted by Pied Piper Management Co., customers who do not receive some kind of response within 30 minutes of contacting a dealership are likely to take their business elsewhere. But the study also found that one in four dealerships waits more than 24 hours to get back to an online customer, This isn’t an issue for Greenway Dodge. “The only reason [our salespeople] don’t make it to the nine-minute mark is because they are with a customer or they are on the phone, or they are working a deal,” Lopez explains. Not only does Lopez’s team respond quickly, they’re also trained to uncover and address a customer’s specific questions. “The first and most important thing when you get a lead is to read the lead,” Lopez stresses. Internet salespeople at Greenway Dodge provide their name and title, as well as ask customers how they want to be contacted — by e-mail, phone or text. Greenway Dodge’s 21-member Internet team is trained to respond to an Internet lead within nine minutes. David Kain, president of Kain Automotive, a provider of sales training and digital marketing solutions, is a big believer in more personal responses to Internet leads. He warns against using the automated response solutions featured in most customer relationship management (CRM) systems, as he feels they hamper a dealership’s ability to convert the lead into a sale. Kain became involved with Greenway Dodge two years ago when Lopez joined an NCM Associates’ 20 Group Kain leads for Internet and BDC managers. The group meets three times a year and includes 20 non-competing dealers of varying sizes and brands. The problem, he adds, is customers are turned off by templates. “If the dealership has quality communicators who can write well and answer the customer’s questions, they are far and away better off than template e-mailers,” he explains. Lopez also uses the service, which is optimized for mobile devices like the Apple iPhone, to introduce himself to potential customers and to confirm appointments his team sets. He says he’s now looking to use video to discuss payment terms with customers — an idea he got from fellow NCM 20 Group member Terry Moore, Internet manager at Reed Lallier Chevrolet in Fayetteville, N.C.
Skype and Join.me are other video solutions Lopez’s fellow NCM members use to conduct remote appointments. The tools allow dealerships to share the screen with prospects who cannot easily visit the dealership. “We love video communications here at NCM, and I would not be surprised to learn that the dealers who are using video have also discovered it to be a great, non-invasive, yet engaging way to put a personal face on the dealership without forcing yourself on the prospective buyer,” says Kevin Cunningham, director of NCM Associates Inc.’s 20 Group Operations. One of the decisions Lopez had to make once he began employing the lessons learned from Kain and his 20 Group meetings was whether to have his Internet sales team hand off prospects to showroom salespeople. He opted against it, explaining that having his team walk their assigned Internet lead through the entire buying process builds trust between the customer and the dealership. “We work our deals from the cradle to the grave; we don’t pass off to the floor guys,” Lopez says, adding that the decision also made customers more receptive to what’s offered in the F&I office. Lopez’s decision is backed by a recent J.D. Power and Associates study, which found that shoppers who work with the same salesperson throughout the process are more satisfied than those who don’t. Cunningham says that while this cradle-to-grave approach is not a requirement, dealers need to have a well-planned structure and processes for moving the Internet shopper from inquiry to sale. 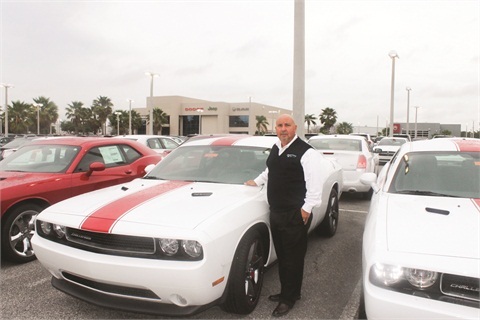 Since Ricky Lopez joined Greenway Dodge, sales orginating online jumped from 144 units per year to about 3,300. 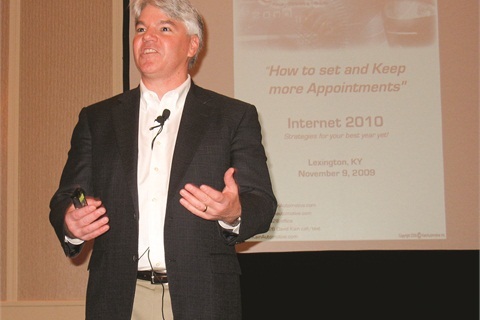 “We’re finding there are a number of business models in force that are having success, from the primary goal to set an in-store appointment to a cradle-to-grave process where the Internet salesperson and the traditional salesperson work collaboratively all the way through to the delivery of the automobile,” Cunningham says. Kain concurs, noting that the difference in closing ratios between a cradle-to-grave and hand-off approach is minuscule. “The right answer is to do what is best for your dealership and follow the process to a ‘T,’” he says. Cunningham also urges dealers to implement key performance indicators to track and measure the results of whatever process they employ. 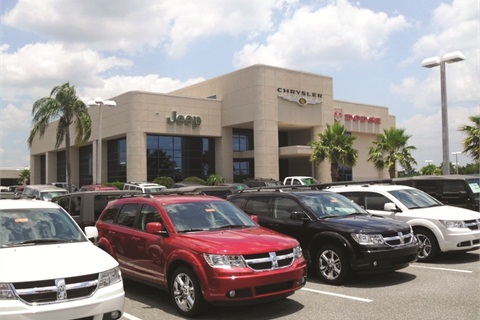 Doing so will aid in “the identification of an ‘internal champion’ of the Internet lead management process; one who is ultimately responsible for maintaining the integrity of the process and keeps the dealership accountable for successful outcomes.” At Greenway Dodge, Lopez assumes that role. He holds his staff accountable by enforcing response times. As he sees it, if you don’t provide customer feedback in less than 10 minutes, you’re out of the sales game. A 2011 study conducted by Kain Automotive backs his belief, concluding that dealers who hold their staff accountable will sell more cars and demonstrate better customer service. Salespeople also make more money, the study states. Kain carries that accountability message to his 20 Group as well. Recently, the group implemented an “accountability buddy” program where each participant looks over the shoulder of another member to push them to achieve the goals they set each meeting. 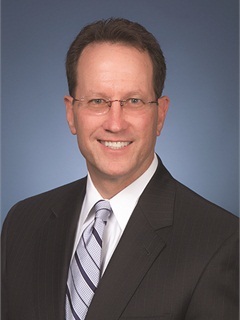 Pictured is David Kain, president of Kain Automotive. Greenway Dodge implemented more changes in its Internet department after Kain visited the store earlier this year. He had discovered that some staff members were “cherry picking” leads in a way that wasn’t beneficial to overall sales performance. Since instituting the program, deliveries for these “throw-away prospects” have never fallen below 40 units a month, according to the dealer. Internet customers are also less brand loyal than traditional car buyers, according to a recent R.L. Polk & Co. study. The firm found that only 30 percent of shoppers will stick with he brand for which they submitted a lead. And just 53 percent will send a request to a dealer from which they previously had purchased a vehicle. That means every customer who goes online is a conquest opportunity for dealers, the study concludes. “Persistent and quality-focused follow-up is the key that unlocks the Internet opportunity for all dealerships,” Kain explains. What today’s Internet customer is loyal to is the dealership that delivers the best experience online and in the showroom. And they’ll be more than happy to refer the friends and family to that dealership as well.